At last ! A programme about Egypt to warm the heart – whet the appetite – and hopefully encourage tourists to return. On Monday evening BBC2 screened the first of six episodes in a new series called ‘A Cook Abroad’. First up TV chef and one half of the Hairy Bikers travelled to Egypt to experience the nation’s culinary offerings, and explore a bit of its history. Travelling from Cairo to Luxor via Fayoum by motorbike, and then on to Aswan aboard the steamship Sudan (the inspiration for Agatha Christie’s Death on the Nile), Myers took time to visit many of the country’s historical sites along the way. After sampling street food for breakfast in Cairo – a bean dish called ‘ful medames’ – Myers headed out to the pyramids at Giza to fulfil his boyhood dream of standing in their shadow. But it was his trip to the ancient necropolis of Saqqara that really got him excited. There, he enthused over the tomb wall paintings dating back more than 4,500 years depicting the baking of bread. As Myers pointed out, this must surely count as the earliest recipe on record! In the oasis of El Fayoum Myers enjoyed dates pulled freshly from the palm tree, then attempted (with little success but much hilarity) to emulate the skill of the fellahin’s wife in tossing her homemade bread atop an oven-dish that looked like a pizza pan, the idea being to make flat bread of pancake-like proportions. In Luxor, Myers sampled a delicious-looking stuffed pigeon in a local restaurant before dressing up to board the steamship Sudan, where the chef taught him to make a local delicacy called um ali (a sweetened bread and butter pudding with hot milk). But first, he visited the West Bank where he sampled shasmi bread with a local called Mahmoud. He noted how the design Mahmoud’s wife baked into her bread was the same as on the loaves depicted in the ancient wall paintings in Deir el Medina, the Village of the Workers. Great to see that some things haven’t been lost down the centuries. To mark the end of his journey, Myers was invited by a family of Nubians for a feast to celebrate the end of Eid Al Adha, and help prepare a traditional meal to be shared with family, friends and neighbours. For Myers, the star of the show was the home-baked Egyptian bread, in all its various forms. For me, it was seeing the warm welcome he was given by all the Egyptian people he encountered. All in all, it was a programme that left me longing to return. I was even nostalgic for the haggling game, watching Myers enter some good-natured bartering with trinket sellers near the Colossi of Memnon. I can only hope others watching the programme had their appetites similarly whetted. 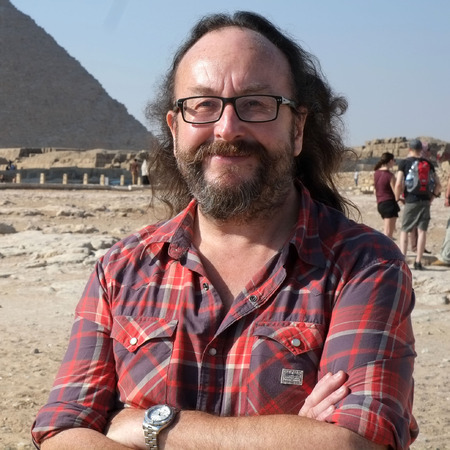 Well done Dave Myers on showing us the delightful side of Egypt and its people. Since Egyptian food in singularly absent from what’s on offer in the UK – as Myers pointed out, “Where can you go for an ‘Egyptian’?” – the best bet is surely to visit the Land of the Pharaohs and sample it with the locals. Fiona Deal – author of Meredith Pink’s Adventures in Egypt – available in paperback on Amazon or to download from Amazon or all major ebook sellers. Posted on February 4, 2015 by Fiona Deal. This entry was posted in ancient Egypt, current affairs, Egypt, egyptian fiction, Food, History, holiday, Television Review, the Nile, Travel, Uncategorized, writing and tagged A Cook Abroad, Aswan, Cairo, Dave Myers, Fayoum, Luxor, Meredith Pink. Bookmark the permalink.